I'm hoping the week is progressing fairly well for all of you'll who do not have to write exams in the next few weeks. Ah, the dreaded exams and at the risk of exposing my readers to any obscenity I'm just going to say #*%&#%&%. However, it is little joys like this that makes me come back to my blog at the end of a very long day. 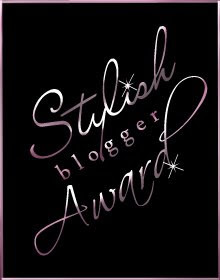 The lovely Shristi of Style Fashion Etc has given me the Stylish Blogger Award. As a ritual, if you've been awarded this award, please link the person who awarded this to you and pass it on 7 other stylish bloggers with 7 facts about yourself. Also, let them know by way of a comment that you've awarded them this award. My first love was journalism and not law. My second love is Human Rights Law, where I'm headed. I CANNOT live without at least 3 cups of coffee/tea in a day. I am also actively involved in theatre. I might want to study theatre at NYU someday. I have the biggest fetish for perfumes. Tried them all, Chanel for keeps. I LOVE debating. Have been debating ever since school and continue to do so. i also have a journalism background! if you love debating and journalism then human rights law is definitely where you should be! congrats on this stylish award, and thanks so much for passing it on to me. You totally deserve the award and all the love! :) Always good to know a 'little' extra about the bloggers. You are multi talented, it seems!!! Thanks for passing the award to me! :) Appreciate it! I hope all your passions stay alive & in fact, grow with time. Wish you all the best with your exams. 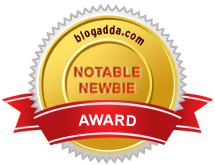 I'm glad I was a recipient for this award :D Brings all the bloggers so much closer! Congrats for those who received the awards.. So great blogger that I knew already and definitely going to check the others out.